Today was the second day of the 2010 PSYOP Regimental Week hosted by the 4th Military Information Support Group (MISG). The final portion of the program was devoted to honoring two winners of the Gold McClure Award, the highest award to be presented to PSYOP professionals. I'm humbled to say that I received the first production award (three prototype medals were given out last year) and that COL (R) Jack Summe former CDR of the JPSE (later JMISC) and 4th POG was the other. I was asked to present a "State of the Regiment" address. Good Afternoon Brothers and Sisters of the Regiment. I am humbled to have served as your Regimental Honorary Colonel since 2003. This is my first and last “State of the Regiment” and while I will address the PSYOP brand in a few moments, the program over the past day and a half has caused me to change my prepared remarks somewhat to take advantage of this ‘target of opportunity’ of having all y’all in the room. First, let me address the name change, in listening to all the talk yesterday, it occurred to me that the name change is like the mating of elephants – it’s done and high levels and needs to be executed very carefully. Turning to yesterday’s keynote, it is clear to me that BG Sacolick is the first SWC Commander in my memory, which in view of my grey and lack of hair is quite long, to really ‘get it. On behalf of the Regiment, we look forward to great things together. Next I would like to address IO. Monday I gave a talk in the CyLab series at Carnegie Mellon Institute. My topic was “The Civilian Perspective of Cyber War” and my analysis was built upon my military background in SIGINT, EW, and crypto and from a career of information security marketing. I also have PAO background serving as a volunteer PAO for my local Red Cross Chapter and working three major exercises at DINFOS, the PAO school. Having said all that, I believe we need to look at the information battle space from the perspective of our customer – the Commander. He or she wants to bring to bear all the weapons at their disposal on the target. PSYOP is the CDR’s weapon to directly influence the population while PAO is the indirect influence weapon by reaching the target audiences through the media. These two must work in concert to be effective. In the case of urban areas, and more elite target audiences, Cyber PSYOP combined with CNA and CNE will be brought to bear. Unfortunately, most CDR do not have the requisite skills to orchestrate all this and more. They will turn to their staff to see who can do this best for them. I hope that it will be our Regiment, those of you sitting out there who step forward. If not, we will always be relegated to a junior varsity status. We are in the midst of what can be considered an unpopular decision to change the branch name. We are past the point of debating whether it is a good idea or a bad one. Our superiors have issued the order, and so we will carry it out. Having worked in High Tech marketing for Symantec, a devoutly brand conscious organization; let me offer some advice about our new “brand” going forward. Rest assured that our adversaries and enemies know who we are and what we do. They will continue to do whatever they can to deny us the high ground of the information battlefield, no matter what we decide to call ourselves. The Branch name or brand is a tool to help influence our customers, allies, and as we painfully learned yesterday - Congress. Our branch name needs to convey what we do simply, clearly and in a memorable positive way. Pandering to political correctness or developing some random sequence of words or acronym will not suffice. “ Influence operations” is what we do; we help CDR achieve their objectives by influencing the local population to behave in the way most conducive to the execution of the mission at hand. Our new name needs to convey our abilities instantly and connote the professionalism and spirit of the Regiment so that every soldier can be proud of it. Today’s PSYOP Soldier is performing admirably. 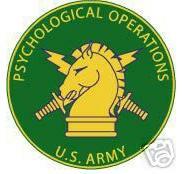 Success on the battlefield has resulted in greater demand for PSYOP skills. This in turn has resulted in a high and perhaps unsustainable Optempo. Yet our soldiers continue to deploy and they continue to perform in an outstanding fashion on the battlefield, in the embassy, on the streets of foreign lands. Tomorrow’s PSYOP Soldier will need to be even more versatile and more resilient than today’s. As usual we are always more prepared to fight the last war. While it is dangerous to forecast the future, I personally believe that we will see future military actions in a variety of ‘undeveloped’ countries ranging from Africa to Asia and we are likely to see increased demand for influence operators closer to home in Latin America. No matter where we are asked to deploy, the basic PSYOP skill will still be on the street. PSYOP soldiers will always function in foreign cultures and work with a myriad of languages both common and obscure. However, as we continue to battle hostile non-state actors and as they employ the Internet and smart phones, we will have to transition our messages to these new media in order to block recruitment, interdict plans and influence the educated and affluent who have access to these technologies. BG Sacolick’s selection process for PSYOP is a needed step forward to insuring that our Regiment is manned by the most qualified personnel. A by-product of the selection process is the increased espirit de corps that comes from such a selection process. Our Army PSYOP forces are split into three separate chains of command. The JMISC reports to the Commander of USSOCOM, the 4th MISG reports to ASOC and the two Reserve POGs report up the Army Reserve Chain of Command. To say this set up is ludicrous is to be kind. The greenest 2nd LT is well aware of the principle of unity of command. The world we live in is a complex and dangerous place. Our adversaries know no rules and no borders, yet our PSYOP forces serve multiple masters and we are hobbled by it. If SecDef Gates had the time to bless a name change, he and his staff need to correct the wrong of splitting the force. I don’t propose to speak for our brothers and sisters in CA, but the time has come to put USACAPOC back under ASOC so that there is a single chain of command upwards to SOCOM. This would position Admiral Olson as the top dog in PSYOP and as such it is overdue for a PSYOP BG to Command all PSYOP forces regardless of their component. We also need to recognize that our organizational model must account for the spectrum of influence operations. Just as Corporate Marketing is responsible for brand management and insuring consistency across the corporation, SOCOM and perhaps the JMISC should be recognized as the ‘strategic lead’. I could not have delivered a more powerful argument for this approach than Roger Smith’s outstanding presentation on the Trans Regional Web Initiative which should serve as a good example for all to see. It showed how corporate type marketing can maintain standards and consistency and allow Regional Influence Forces would be to localize messages and materials as necessary for their AOs under this umbrella of consistency. His presentation also made a case for saying that it makes sense to centralize Cyber PSYOP as a force. The global nature of the Internet does not require local presence. The specialized technical and creative skills needed to exploit the on-line world can be centralized and available as needed. The Cyber PSYOP force needs to work closely with the Cyber Command to optimize Cyber PSYOP doctrine and to avoid information fratricide and to insure that it employees the latest in cyber defense, hardware, software and techniques. Let me turn now to the future of the Regiment. While we are a relatively new branch, we have a proud history. What we lack is a strong association. While both the PSYOP Veterans Association and the PSYOP Association continues their work under their respective charters. The BLUF is that we need a popularly supported and financially viable regimental association. The CA and SF Regiments have exemplary associations that attend to soldier welfare, preserve the lore and history of the branch and help to tell their Regimental stories to Congress. Experience has taught that merely merging the current associations is not a satisfactory solution. A new organization needs to be created that is beholden to no particular constituency and that can be supported and driven by the serving force. While the retired force and other Regimental supporters can help, the burden on building membership rests with those who serve. Before I close, let me offer a bit of guidance and advice to the Council of Colonels. For better or worse you are the senior PSYOP leadership and must act as such. Drop you personal patches and agendas at the door when you meet and act for the good of the Regiment. As our serving leadership, you owe nothing less to the troops. Also, don’t be afraid to seek counsel from other quarters. My predecessor, COL (R) Al Paddock has been a strong supporting force to me as those who have preceded you can offer their insight and wisdom to you. It has been my honor to serve the Regiment as a soldier and as your Honorary Colonel and I will continue to do so in the future. I’m pleased to say that my PSYOPRegiment.blogspot has been doing well, thanks in part to the name change, and thanks to the Internet, old soldiers don’t even have to fade away anymore, they will always be on the Internet. For me this will be a bittersweet occasion as it will be my last one as the Honorary Colonel of the PSYOP Regiment. Surely the time has come for another senior PSYOP officer to assume this honorary role and I’m delighted that the designee will be an outstanding bridge between PSYOP of the past and military influence operations of the future. Strangely enough I found out about the ‘replacement’ quite by accident – that fact speaks to the nascent nature of the PSYOP Regiment and the need to attend to military custom. I’m looking forward to the program which will include updates from the Groups, the Joint Military Information Support Command and our sister services. I’m also looking forward to touring the Media Operations Center and seeing the latest and the greatest and comparing what they have to what I see in the heart of Silicon Valley. Most of all I’m looking forward to mingling with the troops and learning about what is really happening in the field. While I’m a very hard grader and am rather tough to excite, I am always gratified by the level of our PSYOP soldiers and their ability to perform in an outstanding manner under the most adverse of circumstances. • The PSYOP Brand – what do we really need? • Unity of Command: why don’t we have it and what do we need to do to get it? The Blog has been silent for a few weeks because my wife and I have been on a 2 week cruise through the Panama Canal. We made a pact and turned the iPhones off and locked them in the room safe from the time we got on the boat until we disembarked at San Juan on Monday, 11 October 2010. We were also off the grid so if I didn’t know something or wanted to learn more I had to go about it in the old fashioned way. We left San Diego made 3 stops in Mexico and 1 stop in Cost Rica before transiting the Panama Canal. Our last two ports of call were Aruba and Curacao. Our visit coincided with Curacao’s last day as a part of the Netherlands Antilles; on 10/10/10 they would become an independent country within the kingdom of the Netherlands. As we drove around I thought about this unique island as a PSYOP venue. In some respects it would be an ideal PSYOP venue as it is not very big, but has a literate population that has access to mass media including Internet (free Wifi is a selling point for restaurants) and of course TV and radio. Curacao radio has some interesting aspects including the first use of solar power by Radio Hoyer. From a cultural perspective there is an affinity for the Netherlands of course, and a sibling relationship with Aruba, Bonaire, Saba, St. Eustatius and Saint Maarten sister islands from the former Netherlands Antilles. While seemingly idyllic, the island also has its own language, Papiamento which is described as ”a mixture of Spanish, Portuguese, Dutch, English, French, and it also has some Arawak Indian and African influence.” (see http://www.papiamentu.com/). It struck me that a Curacao like construct might be an innovative PSYOP practical exercise because it would involve a variety of key ingredients: unique language and culture, connection to a European nation, modern communications, variety of ethnicities and proximity to a significant Communist nation – Venezuela. In fact the floating market in Curacao consists of Venezuelan products sold by Venezuelan citizens. While I recognize the need to focus on today’s conflicts, case studies and hypothetical situations such as might be symbolized by Curacao are worthy of consideration as teaching tools to help foster creative thinking and build skills without the constraints of today’s battlefields. Creative thinking is the way that PSYOPers have fought in the past and will do so in the future. Being able to apply a variety of tools and techniques in an unstructured environment is often the key to success.